Long View of London from Bankside by Wenceslaus Hollar, 1647. Wikimedia. The earliest references to the wine of Chateau Haut-Brion in England are found in the cellar book of King Charles II for whom 169 bottles of “wine of Hobriono” were served in 1660 and 1661. Just a few years later Samuel Pepys famously drank “a sort of French wine, called Ho Bryan” at the Royal Oak Tavern. Unbeknownst at the time it would soon be difficult to procure French wine. 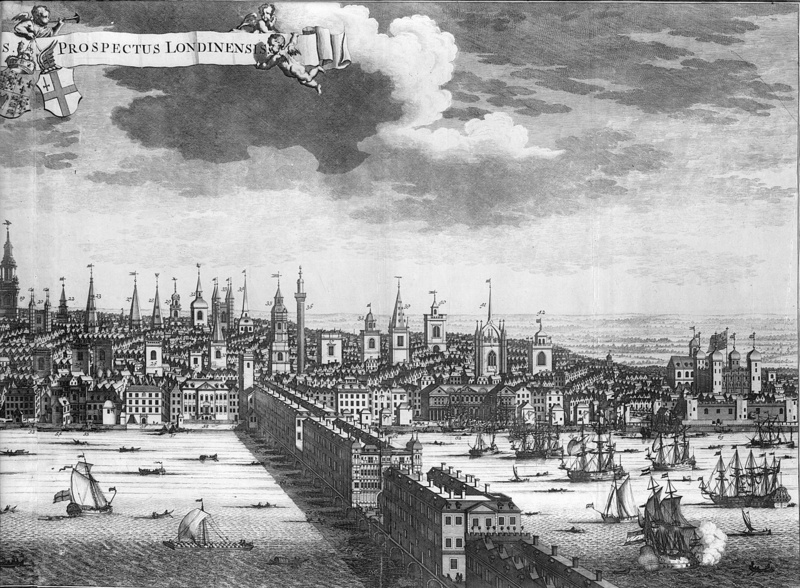 Between 1665 and 1666, the Great Plague of London killed almost one quarter of the London population only to be followed by the Great Fire of 1666 which destroyed the central part of London. Outside of London, the Second Anglo Dutch War raged on the seas during the same period. It was a war fought to control the sea and trade routes. The Calendar of State Papers of the reign of Charles II are full of references to wine. During the war the accounts detail the capture of prize ships sometimes “richly laden” with wine. So much wine was brought into some ports that prices even lowered. After the war merchants resumed purchasing wine from France. The calendered accounts follow this normal trade in wine but now add comments on size, price, and sometimes quality of the vintage. For example during October 1668, many English ships were loading up on wine at Bordeaux even though “the French hold the wines at great price.” There was less of the 1669 Bordeaux vintage to go around with one report from October 1669 claiming “that there will not be so much wine made there as formerly”. It is possible that the smaller 1669 vintage is what Lord Montague purchased from Richard Blatchford when he was billed £24 for two hogsheads of “Aubryan wine” on November 19, 1669. This is, of course, the wine of Chateau Haut-Brion. The 19th century account of this bill was only brought back to contemporary attention by Asa Briggs in Haut-Brion (1994). It turns out there is another 19th century account of the purchase of “Aubryan” which has been forgotten. In 1669, Eton College purchased one hogshead also at £12. This account was perhaps forgotten because the author confesses, “I am entirely in the dark as to Aubryan, Cawos, and Palm wine. The first is low priced”. Robinson, Jancis. The Oxford Companion to Wine. 2015. 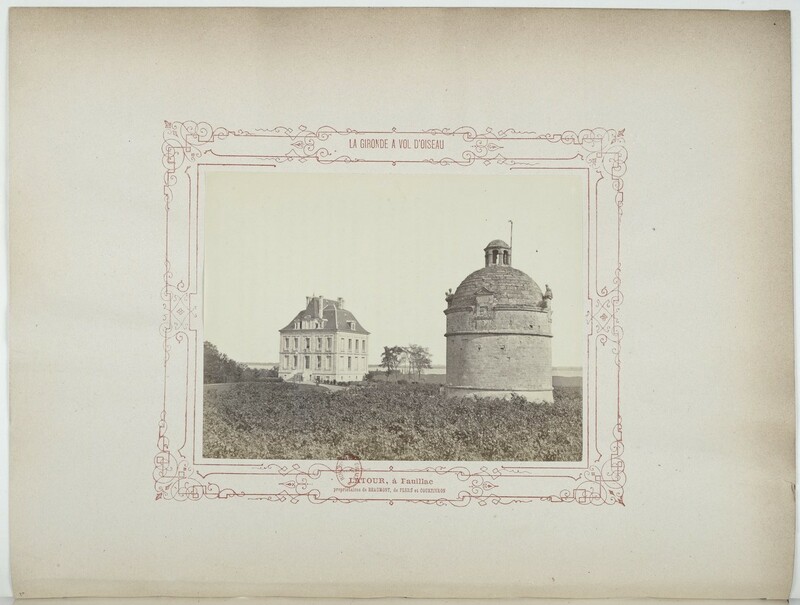 Pierre Aussel published his La Gironde a Vol d’Oiseau Ses Grands Vins et Ses Chateaux in 1865. This was a comprehensive treatment of the wines and vineyards of the Gironde that included history, production methods, and commerce. Pierre Aussel then collaborated with Alfred Danflou in producing a second edition of his book. Together they explored the vineyards and chateaux marveling at both the monumental and picturesque. 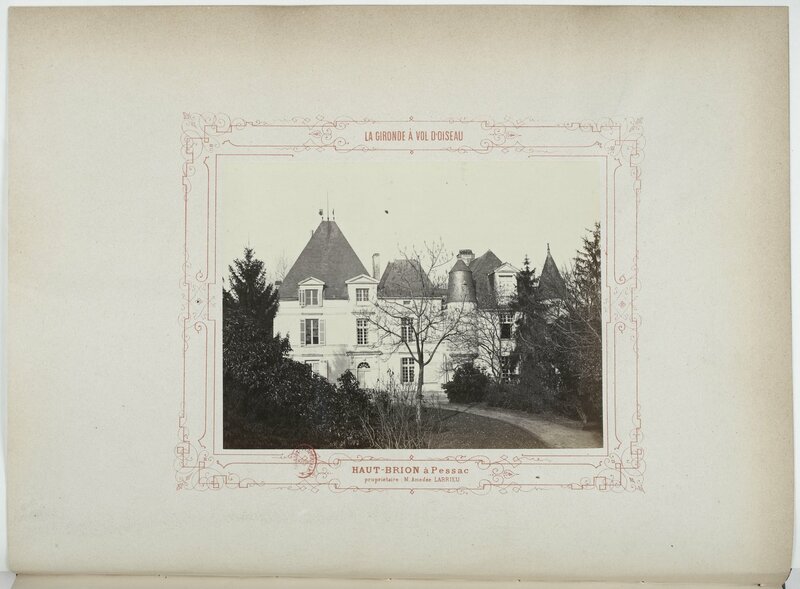 They were captivated by the crenellation, turrets, porticoes, and pinnacles such that they wondered why they had never seen photographs of the chateaux in a gallery. They decided to capture “ces monuments ancients et moderns de notre viticulture national” as photographic art. 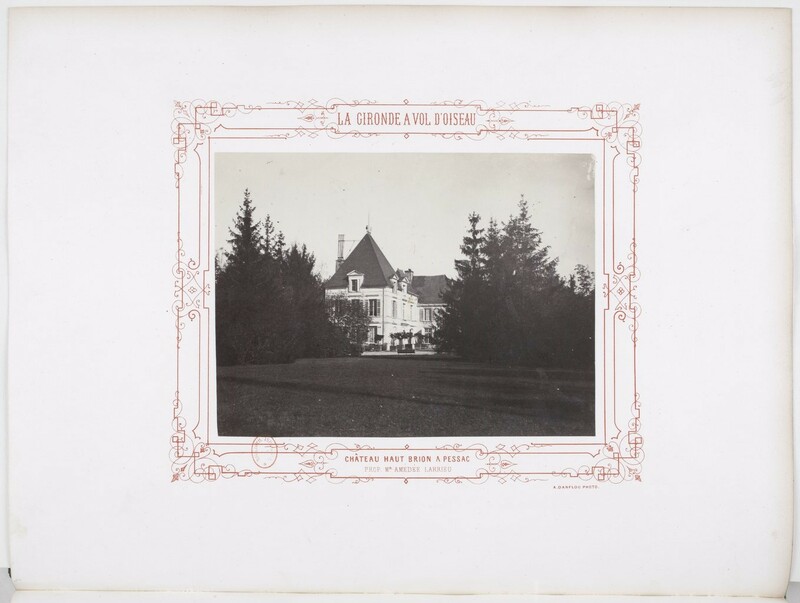 This effort was manifested in the first edition of Les Grands Crus Bordelais which was published in 1866 and focused on 15 of the first and second growth wines. The second edition was published one year later in an attempt to be complete. This edition spanned two volumes which covered the first, second, third, and fourth growths as well as Sauternes. I have included images of the four first growths from both editions for comparison. 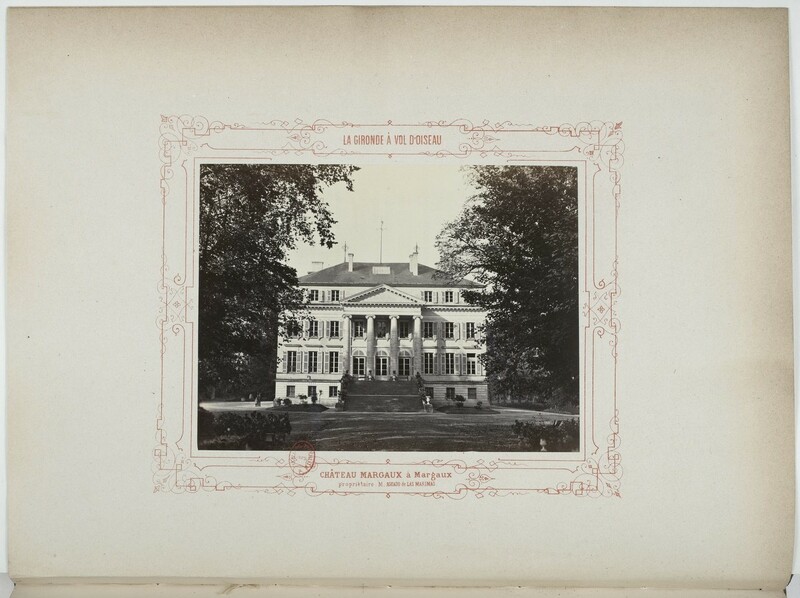 The photographs that appear in the first edition are more casual. 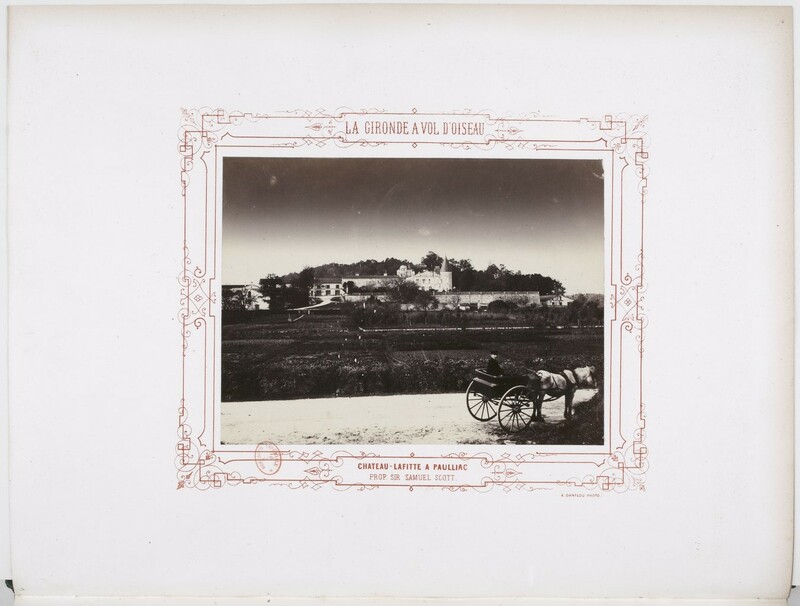 That of Chateau-Lafitte contains a road in the foreground where a horse and cart are stopped on the side. The driver has turned his head to watch the photographer. 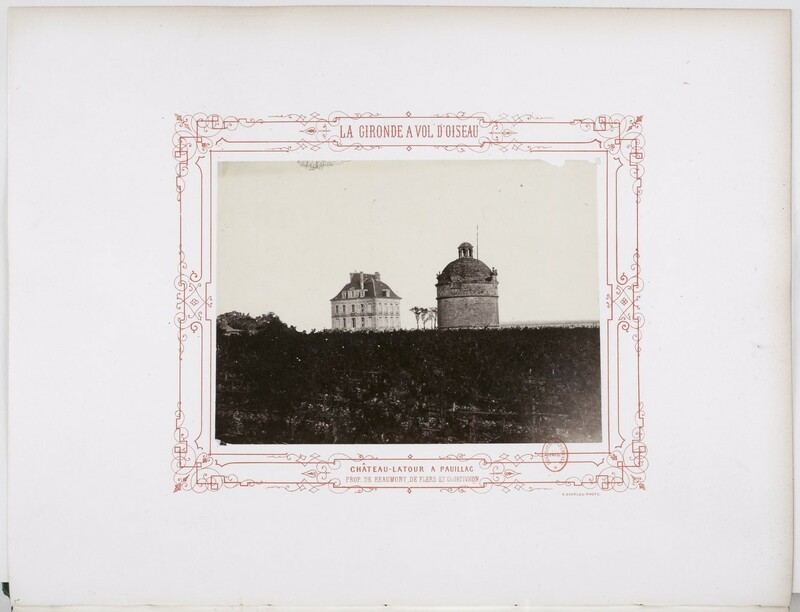 The photograph of Chateau Margaux was taken outside the gate and is slightly angled, leaving the sense of being an observer looking in. 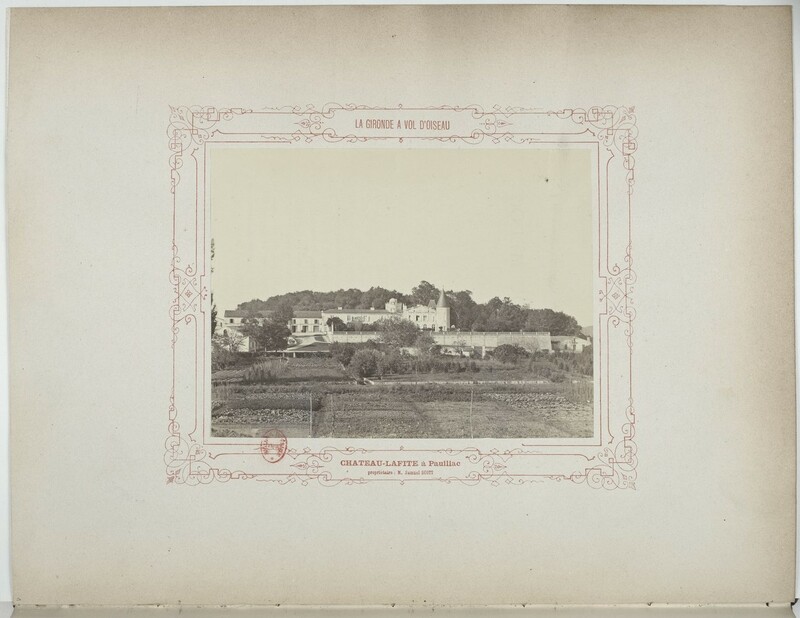 The image of Chateau Haut Brion is of the now uncommon side. 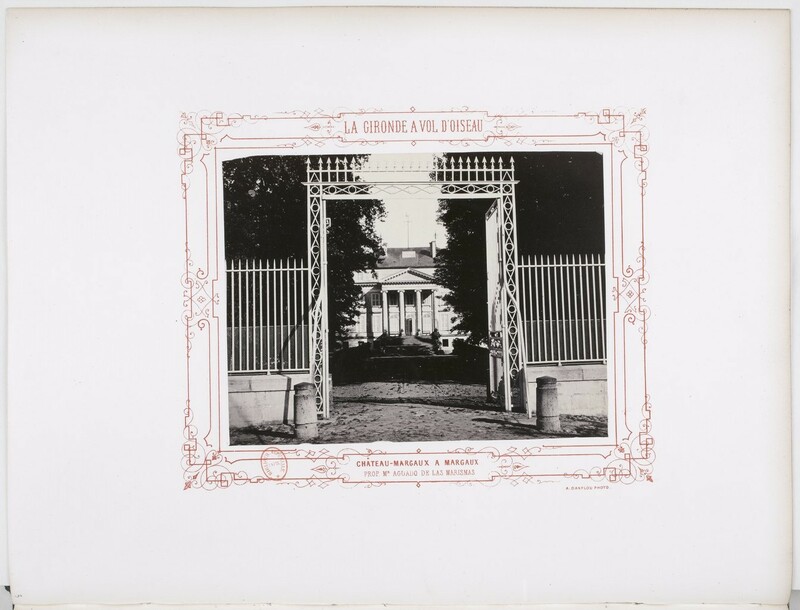 The photographs in the second edition show more studious composition. The name of Chateau Lafitte changed to Chateau Lafite. The images are immersive with better perspective such as that of Chateau Latour that may have been taken on a ladder. Chateau Margaux was photographed within the gate and Chateau Haut Brion now features the famous facade. Please review the pictures I have included in this post but I strongly recommend you review the archive quality images referenced below. A quick Google search for “Haut-Brion import Thomas Jefferson” returns a number of results. Most of these results, including the Wikipedia entry for Chateau Haut-Brion, all state that Chateau Haut-Brion became the first recorded first growth wine to be imported to the United States. The Wikipedia entry cites Karen McNeil’s The Wine Bible (2001) followed by referencing Thomas Jefferson’s letter to his brother-in-law Francis Eppes dated May 26, 1787. The Lea & Sandeman – Chateau Haut Brion page is even more generous stating “Haut Brion was the first Bordeaux wine known to have been imported into the USA…”. Karen McNeil did not write that Chateau Haut-Brion was the earliest first growth sent to the United States. She simply wrote that Thomas Jefferson had “purchased six cases to be sent from the chateau to Virginia”. As a result it is worth looking into this claim. Thomas Jefferson’s letter of May 26, 1787, notes he was sending six dozen bottles of the 1784 vintage from Bordeaux. He felt this was the “only very fine” vintage since 1779. As described in my post “I am in great distress for want of it, having none”: John Adam’s Inquiries about Bordeaux Wines Prior to Thomas Jefferson’s Classification of 1787 John Bondfield wrote to Thomas Jefferson on April 19, 1785, that he had forwarded, “four Cases containing thirty six Bottles each of our first Growth”. The citations state that the Massachusetts Historical Society holds the invoices and bills of lading but it turns out that they are held by the Library of Congress. Chateau Haut-Brion was considered one of the first growths at the time so it is possible that it was shipped to the United States in 1785. Unfortunately, these additional documents do not detail the specific wines which were shipped. 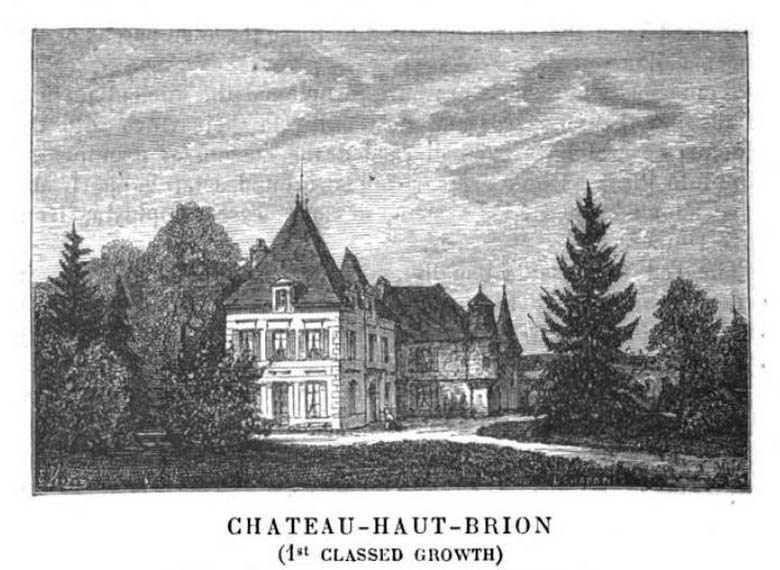 Additional references to Chateau Haut-Brion may be found in historic newspapers. There are at least two earlier advertisements for the sale of Chateau Haut-Brion in the United States during the period of Thomas Jefferson’s first known importation. 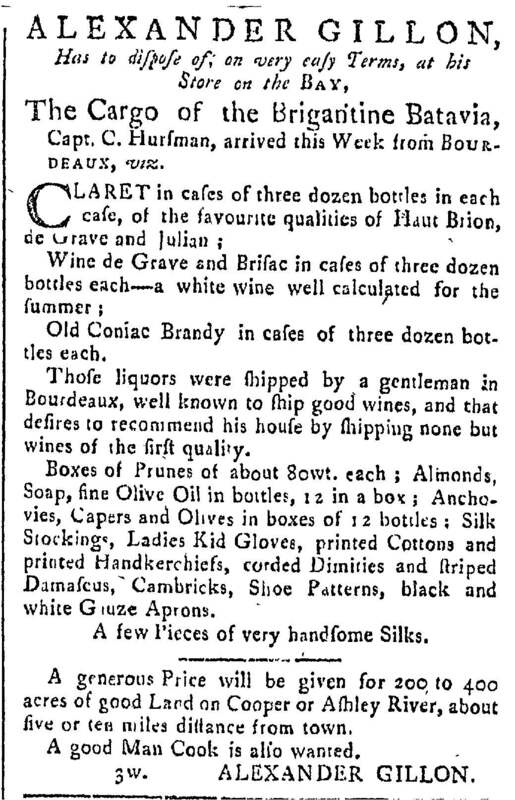 Alexander Gillon of Charleston, South Carolina advertised on June 21, 1783, “Claret in cases of three dozen bottles in each case, of the favourite qualities of Haut Brion, de Grave and Julian”. 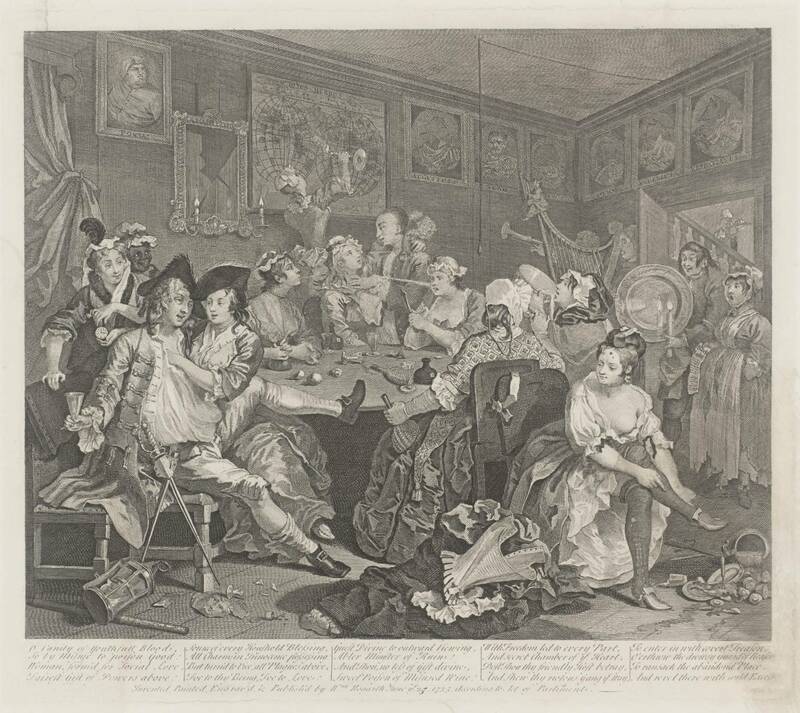 Cornelius Ray of New York advertised on September 1, 1785, “A FEW hogsheads and cases of the best Bordeaux Claret, being the first growths of Haut-Brion and Latour”. However, the earliest importation of Chateau Haut-Brion belongs to Walter Shee and Sons of Philadelphia, Pennsylvania. 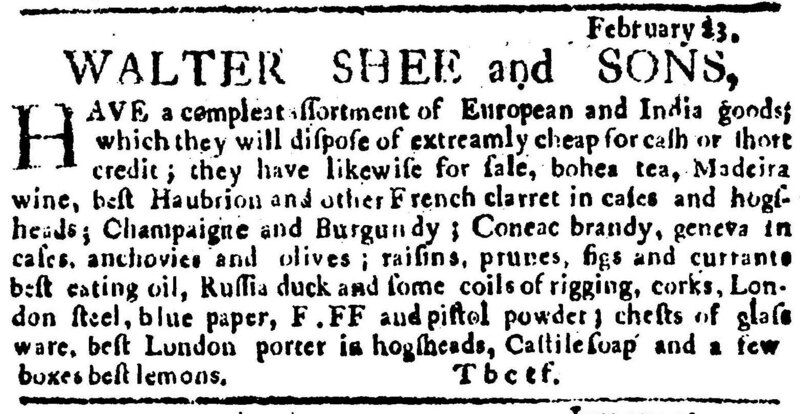 They placed five advertisements between February 23, 1764, and April 12, 1764, that included “best Haubrion and other French clarret in cases and hogsheads”. Walter Shee’s advertisements state he has “a compleate assortment of European and India goods”. This same phrase appears in a short advertisement from January 5, 1764, which includes the first run date of December 1, 1763. A subsequent advertisement indicates the goods were “imported in the last vessels from England”. This importation date is corroborated by the November 30, 1763, advertisement that had been run since June 1, 1763. This advertisement note the goods came in on Captains Hardy’s and Bolizho’s ships from London thus a different set of vessels than what carried the Chateau Haut-Brion. This is an exciting find for it pushes back the earliest known availability of Chateau Haut-Brion prior to the formation of the United States. In moving from 1787 to 1764 we now know Chateau Haut-Brion has been enjoyed on these shores for exactly 250 years this spring. McNeil, Karen. The Wine Bible. 2001. Date: Thursday, February 23, 1764 Paper: Pennsylvania Journal (Philadelphia, PA) Page: 3. See also The Pennsylvania Gazette. February 23, 1764.